Some female dogs can absorb a puppy and it has been said that they can absorb an entire litter. 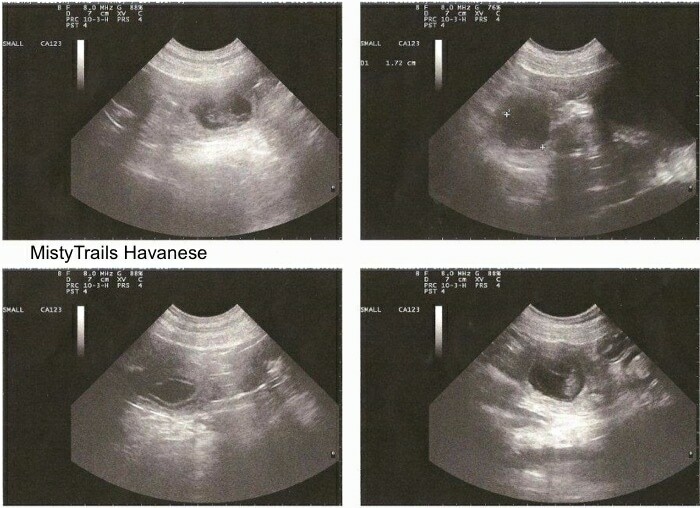 Below are pictures of a pregnant dam confirmed by ultrasound on day 23. The ultrasound shows three live pups and one that is reabsorbing. The ultrasound didn't come through all that clear but on the bottom left is the reabsorbed pup. It looks like an eye without an eyeball. Reabsorbing a pup, or puppies, is sort of like a human miscarriage. When the fetus dies, the mom miscarries it. However, when there is an entire litter it isn't safe for mom to abort a single dead puppy, so instead if a fetus dies the dam’s body absorbs it.